I wanted to whip up something simple and yummy using some of the frozen blueberries I had. I was searching for a recipe and then I thought, why not make something like my Apple Cinnamon Cake (the ultimate moist cake, which has sold very well at markets), but with blueberries instead? 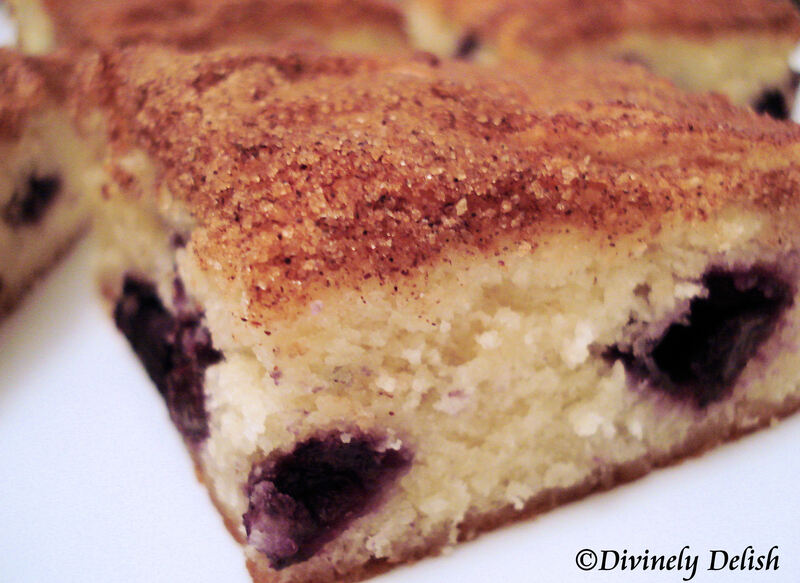 And that’s how I ended up making a “Blueberry Cinnamon Cake”. It’s quick, easy and a whole lot more exciting than blueberry muffins! The cream cheese makes this cake super moist, and the cinnamon sugar topping gives just the right amount of sweetness. Perfect for any time of the day! 1) Preheat oven to 350F. Lightly grease a 13 x 9 x 2 inch baking pan; set aside. 2) In a small bowl stir together flour, baking powder and salt; set aside. 3) In a large bowl beat cream cheese and butter with an electric mixer on medium speed for 3 minutes or until creamy. 4) Add 2 cups sugar; beat until combined. 5) Add eggs, one at a time, beating well. 6) Add flour mixture; beat until combined. 8) Gradually fold in blueberries. Batter will be very thick. 9) Pour into prepared pan and smooth the top. 10) In small bowl stir together 3 tablespoons sugar and the cinnamon. Sprinkle over batter. 11) Bake for 50 to 60 minutes or until a toothpick inserted in center comes out clean. Cool on a wire rack.